Howard Ashman and Alan Menken’s 1986 musical Little Shop Of Horrors eventually ran on Broadway, but arrived there via an unusually long path: It began life as a 1960 Roger Corman horror-comedy, which Ashman and Menken adapted into a stage musical in the early ’80s. The show played off-off-Broadway, then off-Broadway, then in movie theaters as a film adaptation written by Ashman and directed by Frank Oz (a shorter-lived Broadway revival followed years later). The Oz film remains one of the very best modern stage-to-screen transitions, and easily the best to involve a man-eating plant. As Seymour Krelborn (Rick Moranis) explains in the flashback song “Da-Doo,” he comes upon this “strange and interesting plant” during a stroll through the city streets coinciding with a solar eclipse. The plant helps bring customers into the Skid Row flower shop where Seymour and his crush Audrey (Ellen Greene, who originated the role in the off-Broadway play) both work, but Seymour quickly realizes the flytrap-like plant, which he christens Audrey II, wilts unless it feeds on human blood. Complications ensue, as they often do when human blood is made a vital ingredient in a diet. There’s a classicism in the way Oz places the unnamed city’s Skid Row neighborhood on old-fashioned sound stages, augmented by a witty use of cuts, showing off the comic timing the filmmaker honed with the Muppets and would use in many future comedies. (Little Shop was his first non-Muppet feature as a director.) Oz’s ability to push the camera through the soundstage streets, shift into decked-out fantasy sequences, and cut, during Steve Martin’s big solo as a sadistic dentist, to a mouth-POV shot, makes for a satisfying series of production numbers, not just a stage show placed in front of cameras. The heightened reality makes the material both poppier and, somehow, less campy than it sometimes plays onstage. Greene’s Audrey speaking in a breathy, squeaky voice and eventually breaking into song with full-throated Broadway-style abandon is a total theater-style gag, as is the cackling early rock ’n’ roll voice of Audrey II. (Levi Stubbs of the Four Tops provided the pipes for the film.) 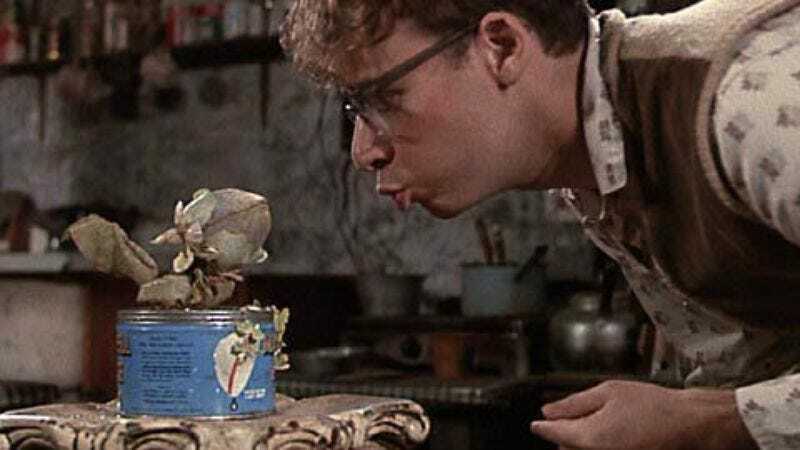 Yet with the intimacy of close-ups, Greene and Moranis make a touching couple, and Audrey II is actually pretty menacing, even when maintaining Ashman’s clear sense of macabre humor. That enhanced sincerity may be why the stage show’s original, darker ending (now available on a director’s cut Blu-ray) didn’t play with test audiences. It also suffers a little for lack of catchiness; the original ending, as interpreted on-screen, interrupts the flow of a great Ashman-Menken song score. As wonderfully insane as the uncovered ending footage is, it de-emphasizes music to indulge in minutes upon minutes of monster-movie spoofery. Both versions, though, have an energy and audacity missing from plenty of loftier adaptations. Availability: Little Shop Of Horrors is on Blu-ray and DVD, which can be obtained from from Netflix or your local video store/library, and to rent or purchase from the major digital outlets.